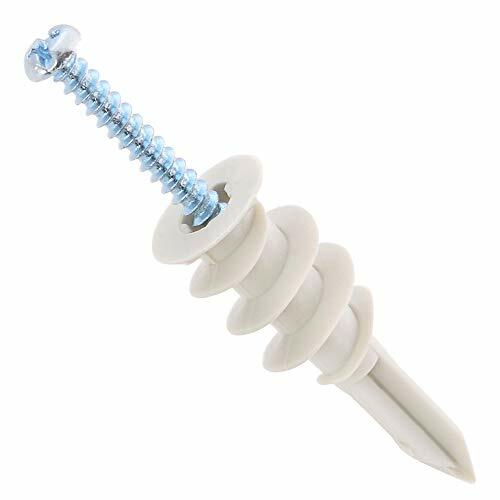 Drywall Anchors are very useful, generally are used to hang picture frames, decorative items, mirrors and shelves. Very easy to install, you can use a phillips driver, a hand drill or a screw gun to screw it. When apply is recommended to make a predrilled hole to avoid break the anchors and damage your wall. They are simple to remove, ideal to drywall surface with 3/8", 1/2" and 5/8" of thick. Stronger and resistant, suitable for applications that needs more power, supports up to 50 lbs. 100 Phillips Screw #8 x 1-1/4"
Ideal for installing bathroom/kitchen accessories, shelving, light fixtures, mirrors, picture frames, and other items to wall. Comes with 100 Large Anchors and 100 #8 x 1-1/4" Phillips screws. Each drywall anchor supports up to 50 lbs. Made with high-strength plastic, ideal for applications in wallboard with 3/8, 1/2" or 5/8" thick. Easy to install and remove. Pre-drilling is recommended for these hollow-wall anchors to avoid damage and break. If you have any questions about this product by HomeDone, contact us by completing and submitting the form below. If you are looking for a specif part number, please include it with your message.